US Vice President Mike Pence rowed back on President Donald Trump’s statements against NATO and the European Union in his first visit to Brussels since taking office. “Whatever our differences, our two continents share the same heritage, the same values and above all the same purpose to promote freedom, democracy and the rule of law,” Pence said today (20 February). Pence, who took office on 20 January, pledged the United States’ “strong commitment” to cooperating with the European Union and insisted the US does not support a breakdown of the EU or of NATO. His comments in Brussels come after he promised the US will remain an ally of Europe during a speech at the Munich Security Conference on Saturday (18 February). 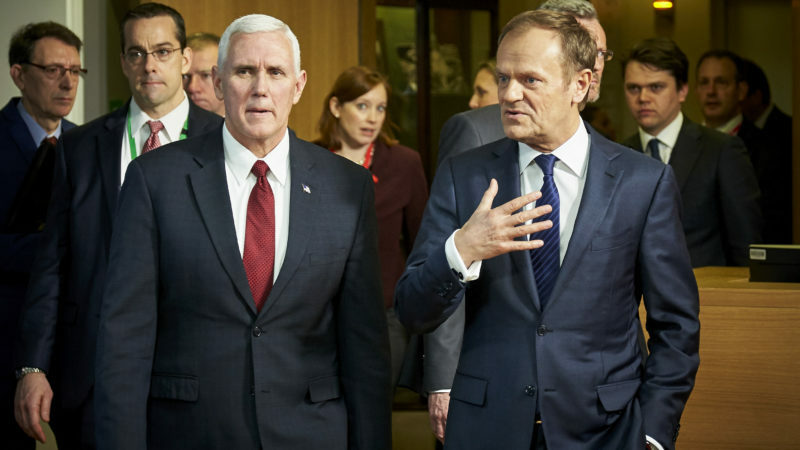 Pence vowed that the Trump administration would support Baltic countries and Ukraine against Russian aggression during an appearance with European Council President Donald Tusk. “In the wake of Russian efforts to redraw international borders through force, we will continue to support efforts in Poland and Baltic states through NATO,” Pence said. Tusk, a former Polish prime minister, said the leaders “truly needed” to meet following US President Donald Trump’s comments in recent months that sparked concern and outrage among European leaders. Trump has called NATO “obsolete” and suggested in an interview last month that more countries will leave the European Union following the UK’s divorce from the bloc. “Too many new and sometimes surprising opinions have been voiced about our relations and our common security for us to pretend everything is as it used to be,” Tusk said. Pence’s pledge to support NATO touched on a sore point among European leaders. During his election campaign last year, President Donald Trump railed against NATO members that spend less than the organisation’s recommended 2% of GDP on military forces and threatened to lessen US support for underpaying ally countries. Only the United States, Greece, Britain, Estonia and Poland meet the 2% minimum spending threshold, according to NATO figures. Trump’s hostility towards underpaying NATO members sparked fears that eastern EU countries could be left to fend for themselves in case Russia invaded their territory. His occasional praise for Russian President Vladimir Putin has only further fuelled concerns that Trump might loosen the United States’ ties with NATO. Pence said the US government will try to improve relations with Russia, which soured in recent years over Russia’s 2014 annexation of Crimea and accusations that Putin ordered the hacking of US Democratic Party officials. “While the US will continue to hold Russia accountable, at President Trump’s direction, we will also search in new ways for new common ground with Russia, which President Trump believes can be found,” he said. Last week, Trump’s Defence Secretary, James Mattis, reaffirmed the US government’s insistence that NATO members step up their military spending. “If your nations do not want to see America moderate its commitment to this alliance, each of your capitals needs to show support for our common defence,” Mattis said during a visit to NATO headquarters. Twenty-two out of the twenty-eight EU countries are NATO members, except for Austria, Cyprus, Finland, Ireland, Malta and Sweden. In a signal of the new US administration’s declared focus on combatting terrorism, Pence also called the March 2016 bombings in Brussels “heartbreaking” and said the US would support the fight against terrorism in Europe through more intelligence sharing between American and European authorities. The White House earlier this month listed the Brussels bombings, which killed 35 people, among 78 terrorist attacks that spokesman Sean Spicer said did not receive “the attention that they deserved”. In an appearance with Pence in the afternoon, European Commission President Jean-Claude Juncker took a dig at Trump’s statements on the EU disintegrating and NATO countries failing to pay their share. “The US needs a strong united EU on all possible issues. We want to step up our own defence efforts,” Juncker said. Juncker has sharpened his criticism of Trump recently over his insistence that NATO members increase military spending. 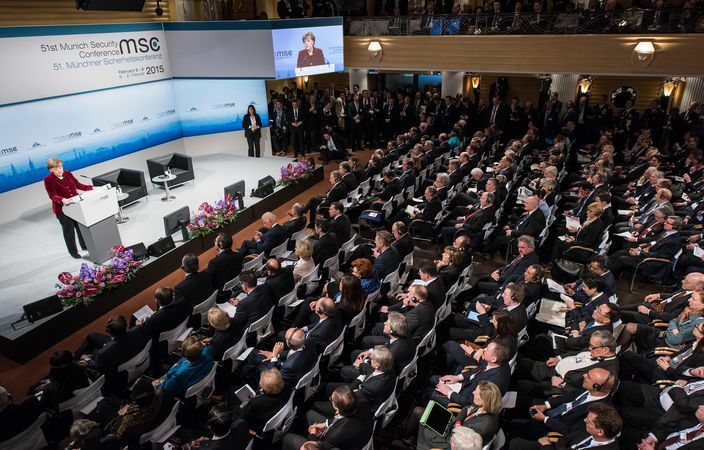 “I don’t like our American friends narrowing down this concept of security to the military,” he said last week at the Munich Security Conference. European countries count aid money and defence funds as part of security spending, according to Juncker. Pence also met with Federica Mogherini, the EU foreign policy chief, earlier this morning and with Belgian Prime Minister Charles Michel yesterday evening (19 February). Donald Trump will visit Brussels for the first time as president during a NATO summit this May. UK Prime Minister Theresa May traveled to the US last month for talks on a potential post-Brexit UK-US trade deal and is so far the only EU leader who has met Trump. 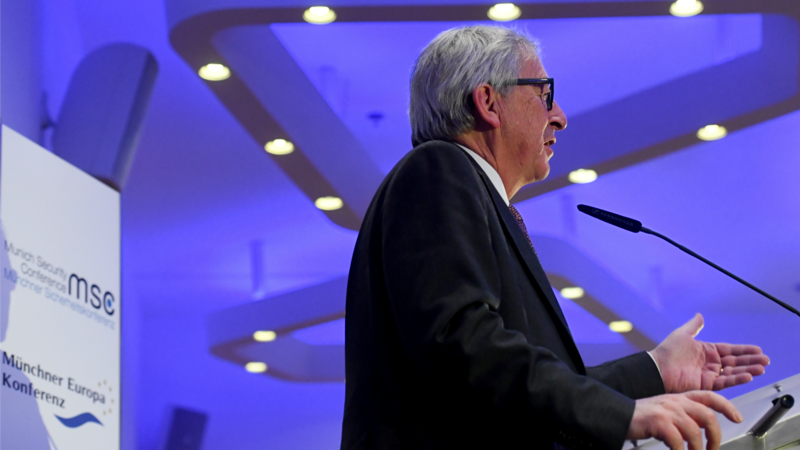 European Commission President Jean-Claude Juncker said yesterday (16 February) that Europe must not cave in to US demands to raise military spending, arguing that development and humanitarian aid could also count as security. His chief spokesperson however said different things.